State Senate gives blue the power in presidential elections. Democrats have only had control of the state Senate for a few weeks, and already they’ve voted to give away Colorado’s vote in future presidential elections. Where when and how will we be protesting? Senate Bill 042 is a dumb idea. It appears to be a Democratic reaction to losing two elections despite receiving a majority of the popular vote, to wit: Al Gore to George Bush and Hillary Clinton to Donald Trump. 1. Under this measure, a Coloradan’s vote wouldn’t count at all except as, say one of some 65.8 million (Clinton’s national total). I would much rather be one of 1.3 million (which is the rounded number of what Clinton got in Colorado in 2016). a. Approximately 35% or so of the registered voters will vote for a Republican or a Democrat, in accordance with their registration, without a candidate ever campaigning in their state for their vote. Thus, with 157.6 million registered voters across the country, Clinton, for example, would have gotten 35% of their votes (55.1 million) without doing anything. b. Assuming that 65.8 million votes would have won her the election (which is what she got in winning the popular vote), all she would have needed, under the proposed scheme, is another 10.7 million votes. c. She could have gotten those 10.7 million votes, over and above the 35%, from just 10 states — California, New York, Illinois, New Jersey, Massachusetts, Virginia, Wisconsin, Maryland, Minnesota, and Colorado. 3. Don’t like polarization? Just think what we would have if a candidate had to campaign in no more than 10 states to win a national election. 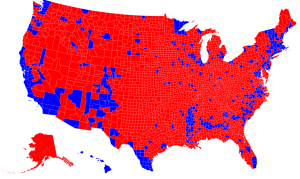 A better idea, that would make the voter’s vote count for more, is to apportion the Electoral College votes, beyond the two attributable to the senate seats, according to the vote in each congressional district – like Nebraska. This would make each congressional district of equal importance, would make each voter’s vote count the same across the state and would make presidential contenders mount a 435 congressional district campaign. It would also encourage Democrats to nominate a candidate who can appeal to the entire country instead of just the population centers. Wouldn’t everyone be better off if presidential candidates had to earn the voters in, say, Holyoke, just like they have to earn the votes in Denver? I like the U.S. Constitution just the way it is and I don’t like this attempted subterfuge.